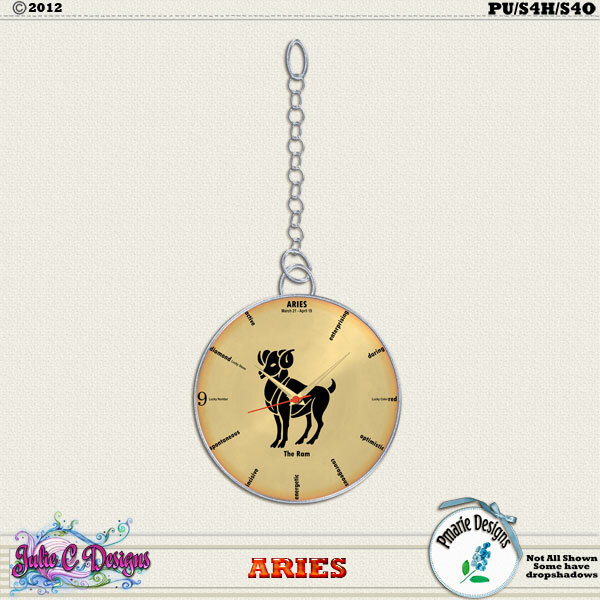 Julie C Designs: New: Aries Collab - 30% off + Freebies! New: Aries Collab - 30% off + Freebies! Make way for the ram! As another March comes to pass, April arrives in triumph. With it, Aries, the fiery ram, first sign of the zodiac. The planet Mars is said to be the ruler of Aries, and appropriately, the color of April is red, symbolic of the red planet and it's iron-rich surface. If you're lucky enough to call April your birth month, you'll know that April's gemstone is the diamond, a reminder that life is full of riches. In this fourth addition to the Zodiac collection by Julie C and Pmarie Designs, you'll find each of these symbols and many more, all designed to help you decorate your April-themed pages. Perfect for project 365/52/12 albums, you'll find all of the basics in this collection like ribbons, buttons, flourishes, and frames, plus a selection of coordinated papers, tags, flairs, and brushwork to embellish your pages. From April Fool’s Day to Earth Day and Passover, if April is your theme, you'll find what you need in Aries. Save more with the Aries Bundle! 50% off!